Referred to by the architect as the “jewel box” of the Center, the Joseph & Alma Gildenhorn Recital Hall is an intimate space with bright acoustics, offering a warm and inviting setting for solo and chamber artists. Adjustable acoustical curtain help ensure ideal sound quality for performance and recordings. At 297 seats, the hall is also an excellent venue for public lectures, dialogues, special events and ceremonies. 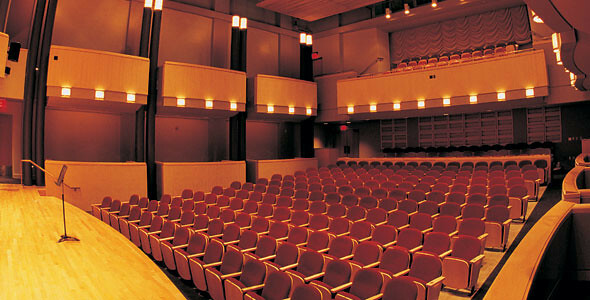 The Gildenhorn Recital Hall, like the Dekelboum Concert Hall and the Kay Theatre, has a specially designed silent HVAC system. Fresh air is constantly provided through a gravity-fed ventilation system that keeps the ambient temperature comfortable, but without the annoying sound of forced air. Concert attendees hear nothing but the music. The Honorable Joseph B. (’51) and Alma (’53) Gildenhorn have made a lasting impact on the University of Maryland. Alma, Member Emeritus of the Center’s Leadership Council, served as the co-chair of the Clarice Smith Center’s campaign in 2001. Joseph, former U.S. Ambassador to Switzerland and 1996 Recipient of the President’s Distinguished Alumnus Award, served as Chairman of the University of Maryland College Park Foundation Board of Trustees. Their naming gift represents their appreciation of the arts and their desire to support and enhance the Clarice Smith Center and its programs. For technical specifications of the Gildenhorn Recital Hall, click here.